It’s comic book day in North America today. I have to wait until tomorrow to get my copy of Daredevil #505, so I thought I’d pass the time by talking a little bit about the first time Daredevil went to Japan. 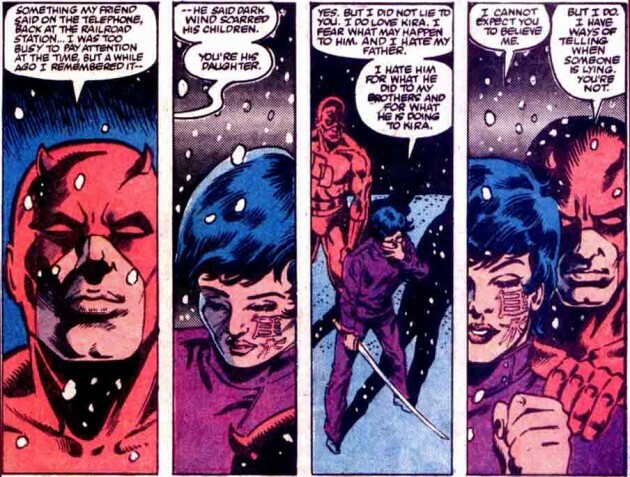 The panels below are from Daredevil #197-199, by Denny O’Neil and William Johnson (though the first panel below is by Klaus Janson). The first panel we’re going to look at is Matt announcing his plans to Foggy, who seems happy that Matt is taking time off from work. The stress of both his jobs is obviously getting to Matt as he’s suffering from terrible dreams of Bullseye on the plane over. To add insult to injury, he’s also suffered a concussion after an attack a few hours earlier. Matt barely has time to check out the local offerings before he’s a target again. 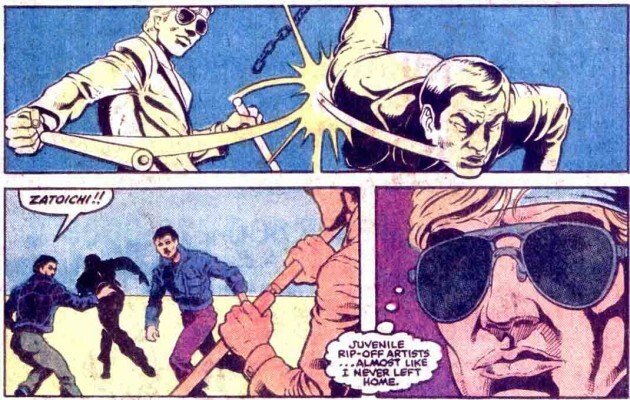 Unlike when he went to Europe during Brubaker’s run, Matt is traveling openly as a blind man, and apparently seems like an easy target. In a wonderful little in-joke, the locals immediately liken him to the famous blind samurai character Zatoichi. Despite all the interruptions, Matt eventually manages to get on board the ship that is carrying Bullseye. Unfortunately, he doesn’t find his mortal enemy, coming across a young woman instead. Her name is Yuriko, and her life took an unlikely turn into supervillainy after this story arc, and she is now better known as Lady Deathstrike. 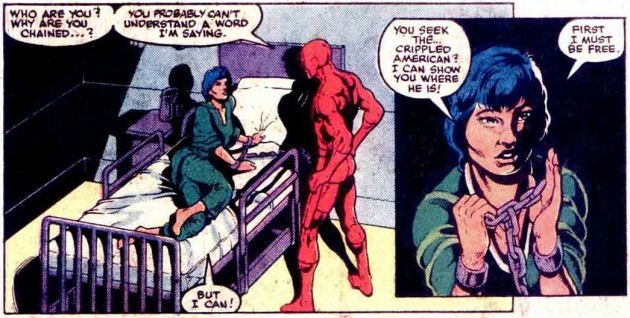 It’ll be interesting to see whether she turns up in the upcoming Daredevil arc. Stranger things have happened. 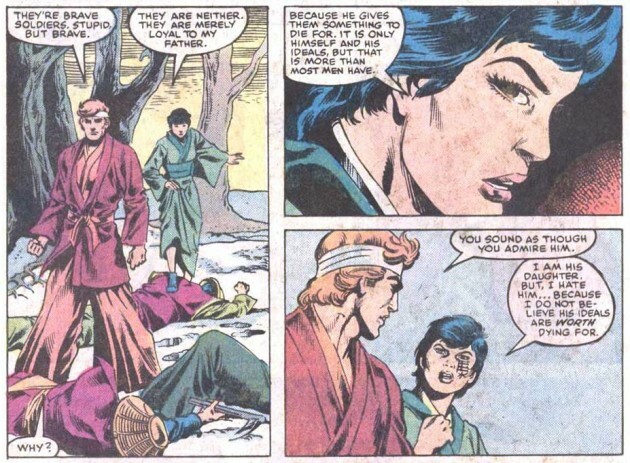 While Bullseye recuperates elsewhere (he and Matt share a strange intermittent psychic link throughout this story), Yuriko tells Matt about their common enemy Lord Dark Wind. She also hides her face which we later find out is due to having been hideously scarred by her father. Who happens to be Dark Wind, though Matt doesn’t know that yet. 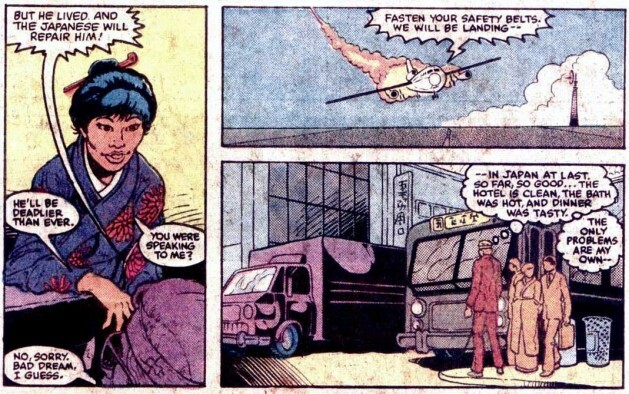 After a conversation with Ben Urich, Matt has managed to piece together the truth behind Yuriko’s and Dark Wind’s relationship, and he gets ready to confront her, assuming she has lead him into a trap. It turns out that Yuriko is in fact on Matt’s side and that she’s only concerned about her lover’s welfare under her father’s control. Included simply for the coolness factor of having Matt battle some Japanese tough guys while wearing a kimono, the panel below shows Matt and Yuriko make their way to her father’s compound. All is well that ends well, as they say. Even though Matt never gets to Bullseye (he shows up live and well in New York next issue), he gets to watch Yuriko and boyfriend Kiro reunite on a sandy beach. Aw, isn’t that nice. Too bad, she would later become a decidedly less charming psycho. Foggy’s a little insensitive in that second panel there. Damn you, Foggy! It always strikes me as interesting how many characters were spawned in Daredevil and went on to other things in the broader Marvel U without returning to Daredevil very often. I don’t think many people even know Lady Deathstrike started here. Echo is on to her own Avengers stuff and does anyone remember Nighthawk? I hope to see Lady Bullseye in the Fantastic Four some day. Does Matt ever run into Lady Deathstrike again? And does he know she is Yuriko?